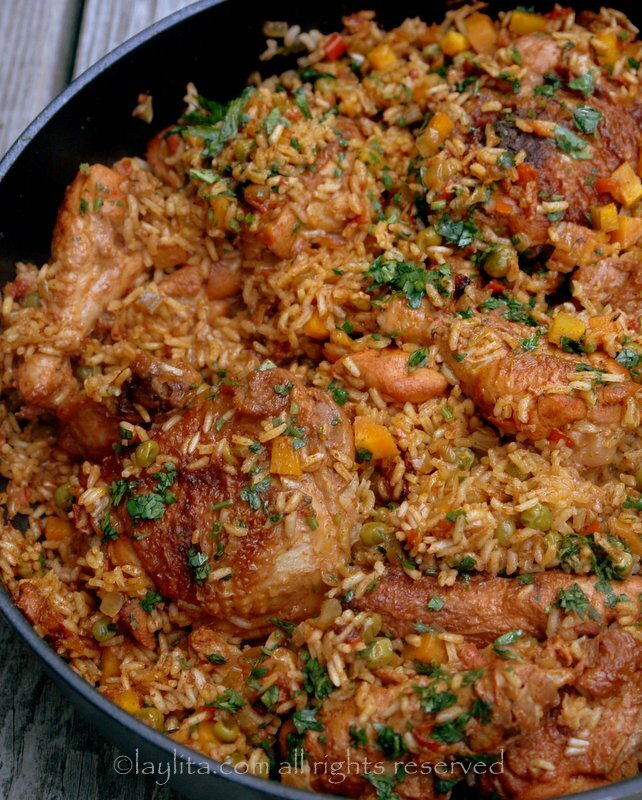 Arroz con pollo –literally rice with chicken – is another one of those meals that I crave when I want a good home cooked meal. Each person’s version of that home cooked meal varies based on their personal experiences. I’m sure that you can remember the smell and the taste of the dish you crave, and of course the pleasure that you feel when you take the first bite is similar for everyone. Why is it that those cravings usually show up right when you’re surrounded by every possible choice -food wise- except for the food you really crave? 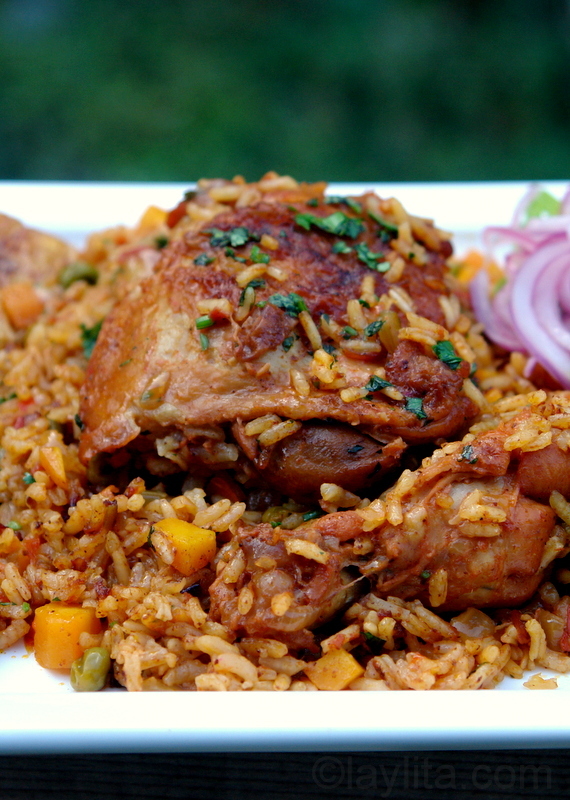 I could go on forever about my theories on food cravings, but back to arroz con pollo, which again like so many other Latin/South American/Ecuadorian dishes has many variations from one country, region, city, or home to another. The ingredients, besides the rice and chicken, will differ from one family’s recipe to another or simply based on what one has available in their refrigerator or pantry. 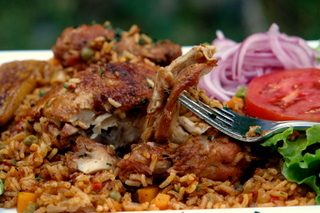 Arroz con pollo, or chicken rice, is a delicious Latin American dish of chicken and rice cooked with onions, tomatoes, peppers, celery, garlic, achiote, cumin, cilantro, among other ingredients. 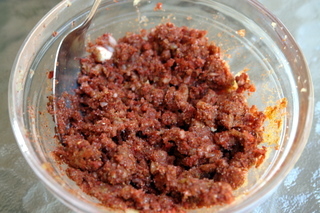 Mix the crushed garlic, achiote, cumin, coriander and salt together. Rub the garlic seasoning on the chicken pieces. Heat the oil or butter on medium high heat in large sauté pan, add the chicken pieces (skin side down) and cook until browned on each side. 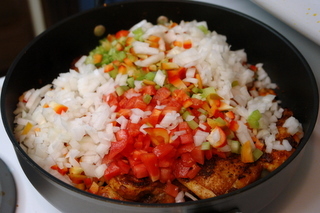 Add the diced onions, tomatoes, bell pepper, and celery, mix well and cook for 10 minutes, stirring occasionally. Add 1 cup of beer or white wine, cook for about 20-25 minutes over medium heat until the liquid is reduced by half, stir frequently. 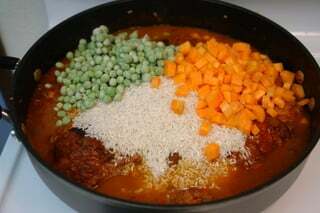 Add the broth or water, rice, peas and carrots, mix well. Cover and cook over medium heat for about 20 minutes. 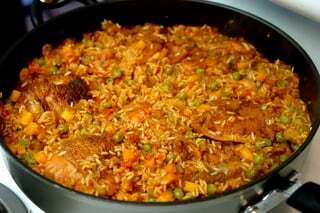 Reduce the heat to very low and cook for an additional 10-15 minutes or until the rice is tender but not overcooked. Stir in the chopped cilantro and serve with maduros fritos or ripe fried plantains, a small salad, pickled onions, avocado slices, and hot sauce on the side. 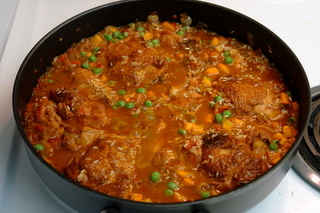 There are also different preparation methods for arroz con pollo or chicken rice, one of the typical ways to make chicken rice is to first poach or boil the chicken until tender, then remove the meat, while separately cooking the rice in the broth where the chicken was cooked, and later combining all the parts together. The other method – which I used for this recipe – is to sauté the chicken pieces with the vegetables and then add the rice and broth or beer/wine and cook everything together until the chicken and rice are cooked. 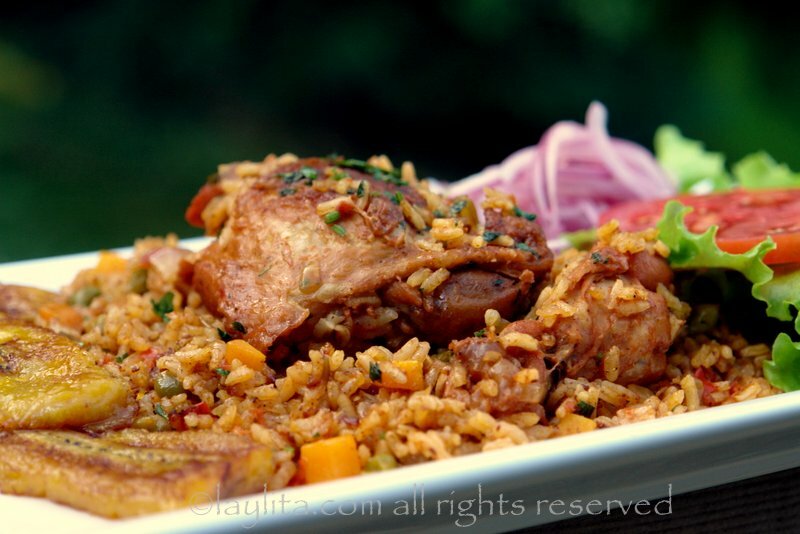 I prefer to prepare the arroz con pollo this way because I like the way all the flavors concentrate together, also the first method – cooking the rice and chicken separately – is more of what I consider a chaulafan de pollo than arroz con pollo. 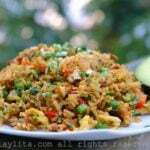 Chaulafan de pollo is an Ecuadorian version of chicken fried rice and it is also a great dish. This chicken rice is a great dish for satisfying hungry people – including a hungry husband’s need for carbs after a long run. I like to serve it with the typical side dishes that accompany many other South American meals: curtido de cebollas or pickled onions, fried ripe plantains, avocado slices and a good hot sauce or aji. I tried this recipe for the first time tonight. I did no find achiote so added a little paprika. 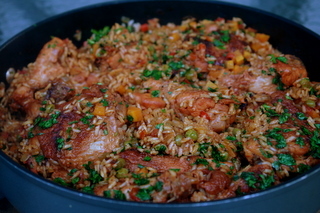 I have made a Spanish Arroz con pollo before but not a South American style. My wife had a friend from Argentina who had a recipe similar to your recipe that she absolutely loves. The only addition I added was some saffron. My wife LOVED the dish and went back for seconds. This will be a staple dish in our household moving forward. Thanks! My boyfriend and myself went to Ecuador this year. So when we had to chose a menu for our Christmas celebration, the choice was natural to cook Ecuadorian and share some of the tast experiences we made during our trip with our family. We went for Fish ceviche as a starter, Arroz con pollo served with tostados, Curtido de cebolla y tomate and Aji criollo as main dish, Mousse de maracuja as dessert, and Naranjillazo to end the menu- all recipes from your blog – It was absolutely delicious! And it made me discover a small Latin American shop in Brussels, where I was lucky to find all the ingredients! Thanks a for sharing these recipes! I will definately try out some more! I just got completed making this for dinner and it was wonderful!!!! My husband and I loved it! I made it for my family and they loved it. I’m not such of a cook but your recipes are making me better. Thank you for sharing the step by step recipes. My mom’s recipes were very vague, just add this and a little of that, never turned out good. I miss my mom’s cooking and all the wonderful Ecuadorian food. I made this recipe last night for a Girls Night OUT! Everyone LOVED it success!.. 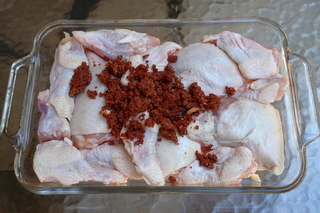 It was delicious and easy to make I added pitted alcaparrado and chorizo!!! I have just found your website with amazing recipes while looking for Beef en daube recipe. I am not sure if I can buy achiote here can I use anything else. Hi Bee – I have a few friends in the UK and they can find achiote (annatto) at specialty Latin stores. You can use paprika powder if you can’t find achiote, it helps add the reddish color, the flavor isn’t exactly the same, but it will still work with this dish. Hi! I am working on a school project and I was wondering what I could use instead of beer! Hi Evy – You can use chicken broth or chicken stock to replace the beer/wine. Thank you for such a fantastic recipe! My husband made this a couple of times now and it is awesome!!! We can’t wait to try some more of your recipes. Not only does my husband get the Arroz con pollo that he loves, but the recipe has become his specialty in the kitchen. You rock Laylita! This is FABULOUS!!!!! I’ve made this 3 times already and making it for dinner tonight again! I like to stir in sliced pimento at the end as well. Delicious! Thanks, Laylita! Your recipes are wonderful! Laylita , thanks so much for this website . 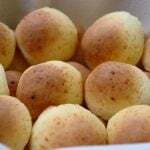 Being an Ecuadorian -American I have grown up with a lot of these wonderful recipes en casa with my mom. However when I ask her for recipes directions all she says is” oh mi hija , use a little bit of this and that ” and never gives me measurements which has ended up in bland or way tooo salty food . But ever since I found your recipes I finally cook food the real ecuadorian way! My husband has never been happier , thank you so much for all these wonderful recipes ! 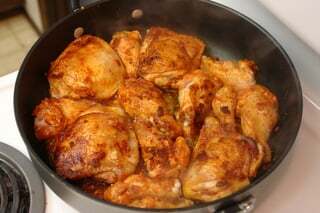 Hi Laylita, do you marinate the chicken first, or you brown it right away? Great recipies by the way. My husband loves your bean stew recipe. Thanks so much!! 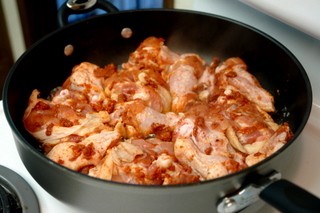 Hi Anne – If I have time I marinate it for a couple hours, if not I brown it right away. Wow!! What a great dish, it was fantastic. Just got back from my first trip to Ecuador a few weeks ago. I looking forward to trying many more of your recipes. This was d-i-v-i-n-e! I served it with plantains, avocado, your aji crillo recommendation. I also made plain white rice (Ecuadorian style) which I actually preferred over that cooked with the pollo. Next time, and there will certainly be many next times, I will make the rice separately. I’m looking forward to trying many more of your recipes! I made this a few days ago and it was a success!! 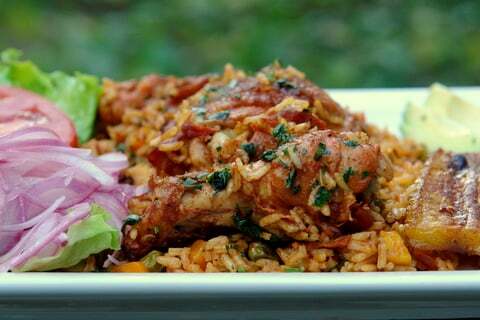 I make arroz con pollo in a different way, but your recipe is easier, faster, and has almost the same taste! I dont use cumin in my personal recipe, but I found it is good. Where do you buy achiote powder? I’ve looked for it at several grocery stores in the ethnic food aisle and in the spice aisle but can’t find it. I usually find it in the Latin grocery stores, you might also be able to find it online. 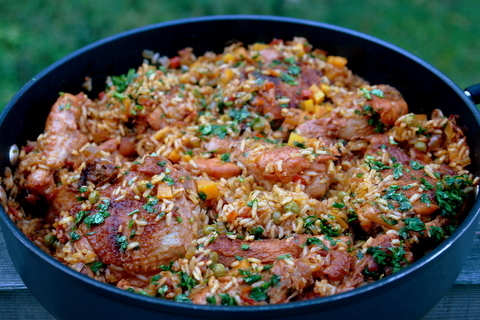 I’m going to cook your Arroz con pollo on Saturday for friends coming here for the Ireland v England rugby match. Can’t get achiote here, just wondering what I can use as a substitute. Your help would be much appreciated. FYI, it’s St Patrick’s day here. Lots of parades going on all over the country and it’s not raining, for a change ! You use paprika instead, it will add the same color, but the taste will be slightly different. If you can’t find achiote you can substitute annatto. I usually use sazon in a pinch which most grocery store carry. My recipe came out great. Achiote and annatto are the same thing – you can find it ground or the whole seeds (which you can simmer in oil/butter/lard to get the essence and color infused into the oil). Ohhhh Laylita… All I can say is you are one talented chica! I just prepared this and it is sooo awsome! I think it is a new favorite for me. So excited to try this recipe! 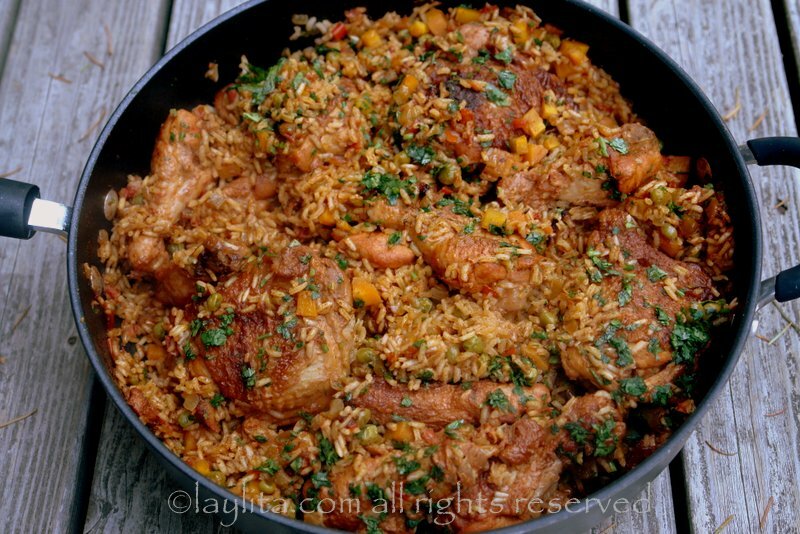 I haven’t had arroz con pollo since I visted Guyaquil in high school! Achiote is hard to find around here but my car needs a new tire RIGHT near a store that will have some. YIPPEE! I haven’t visit Loja yet, but i trust in God I will do it someday. I know you guys speak the best Spanish in Ecuador. I am from Esmeraldas. About 24 years ago I came to the States to work as a broadcaster for the US Gov, and I never left. I met my husband at my place of work, he is from Venezuela, and I have 3 beautiful kids. I was looking for a “quaker” recipe and I found your site. It took me back to my mom’s kitchen. So many of your recipes are just like hers. I am delighted to have found you. Thanks for the great channel you have created for Ecuadorians and for the people who love our country and our food. I live in Virginia and with my husband I work in Washington DC. We are broadcasters for the Spanish Division of Voice of America, an international radio station similar to BBC. You can listen to our newscast and visit us on the Internet at http://www.voanoticias.com. I hope I can hear from you someday. Yummy!! What kind of rice is recommended? Long grain/parboiled…..? I use long grain – but you can make it with any kind of rice. I lived for one year in Guayaquil when I was a teen. At least twice a week this norteamericano would visit the Cantagallo and order Arroz con pollo. It was soooo delicious, and I have been searching for “that taste” ever since. I hope this is it. I don’t cook much at home so it was a surprise when i came out with el arroz con pollo.. They loved it!! Thanks sooo much for your great recipes and step by step photos! Its a big help for a non cooker.. I just wanted to say that your photos and recipes are truly inspiring. I work in IT and have just recently decided to pursue my culinary desires. I’ve always been the go to cook in my home and family and this website just gives me hope that one day I’ll be making dishes as appealing as yours (both visually and…ummm yummilly lol). Made this for my family last night. My parents showed up with dinner so we haven’t eaten it yet. Will tonight, BUT I must say that we did taste it and it was wonderful. I am hoping with most dishes that it will taste even better tonight for dinner. I didn’t have anchiote, but I looked up an online substitute and it was fine. Thanks again for a great recipe. I will definitely make this again. La receta es deliciosa! Pase cuatro meses en Loja y me encantaba la ciudad y la gente! Gracias por publicar este pagina. Your photographs are spectacular!! Makes me want to head for the kitchen ASAP. YUM!! not now! !its midnight, it looks so good! Thaaaaaanks!!!!! It looks awesome!! Cant wait to try it!! Looks great – just perfect for this time of year. I love the shot of it all in the pot. Great stuff. This looks like another winner of a dish, Laylita! 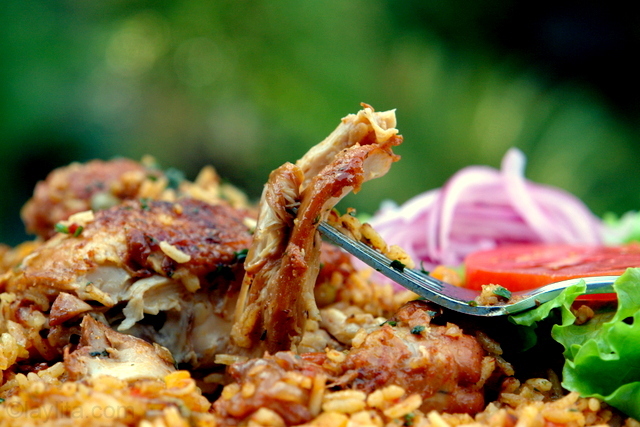 I love the combination of chicken and rice — and this arroz con pollo has all the flavours I like. Bookmarked: thanks! Happy Independence Day! 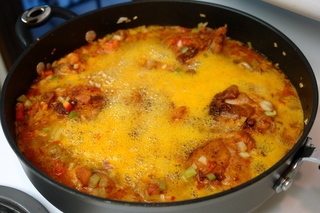 I think it’s time for me to make some arroz con pollo, Laylita-style! That looks absolutely delicious! I definitely have to try making this some time. Beautiful step-by-step photos, and the finished dish is stunning! 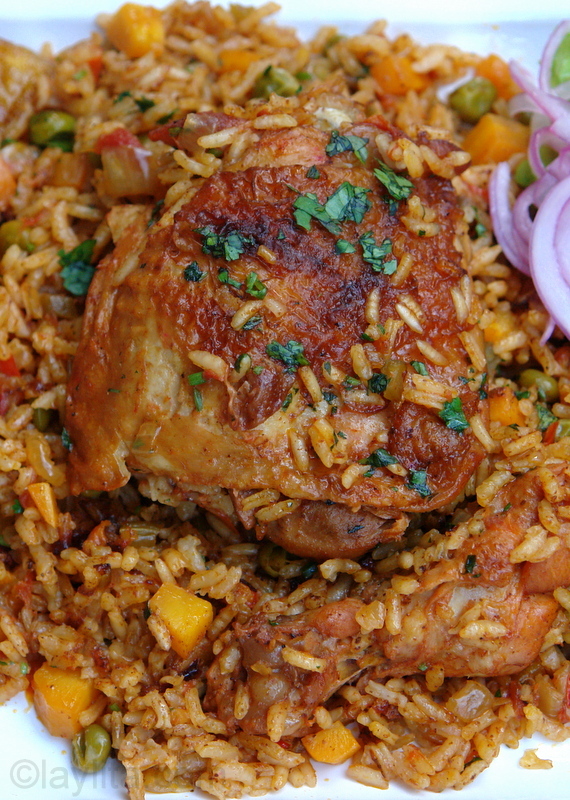 Arroz con pollo is one of my favorite comfort foods, too, even though it’s not the chicken-and-rice dish I grew up with. It’s better! Thank you for yet another gorgeous, yummy looking recipe Laylita! And all the step by step photos…I am definitely going to make this for my family over the holidays! YUM! I agree with Joan – that photo series is amazing! I usually make my arroz con pollo much more simply but I’m going to try a few of your additions! I love beer in my dinner. Oh my gosh. My stomach just started rumbling when i saw the top photo! I can’t even tell you how wonderful this looks! A mouthwatering dish! So colorful, flavorful and deliciously spicy! Yummy! The photolog is as sabroso as the recipe. I am so psyched to see this recipe, this is a dish that I want to get the hang of!